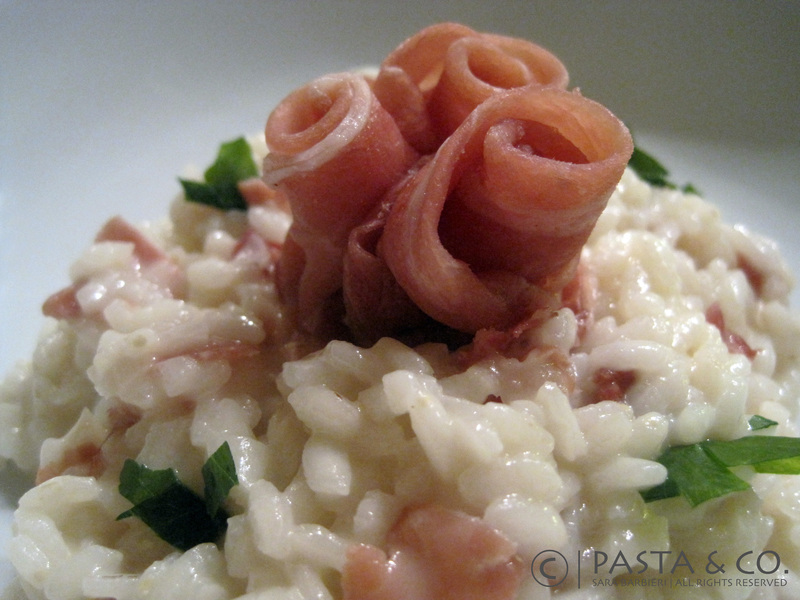 A Romantic Twist: Risotto with Speck, Beer and Mascarpone | Pasta & Co. This flavorful Risotto is something just mouthwatering. Its flavor is creamy (there’s mascarpone in it!) and a little smoky thanks to the delicious Speck, a lightly smoked prosciutto from Alto Adige, and some beer. It’s very, VERY easy to make! I gave my own little something to the original recipe, which comes from GialloZafferano.it, the trendiest Italian blog for cuisine tips. First thing you wanna do is prepare the vegetable stock. Chop the onion, the carrot, the stems of celery and the potato and add a half cube of vegetable bouillon. Throw everything into a saucepan and add 4½ cups of water. Simmer it for 15-20 minutes until fork tender. 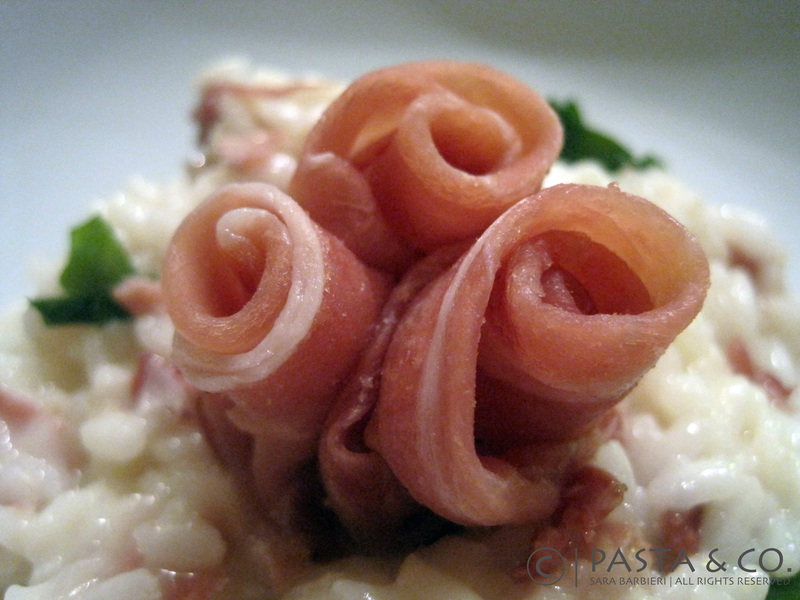 Décor: If you want to give the slices of Speck a rose look, cut 3 slices in half, fold them into two and roll them. Next, cut the speck in strips and chop up the onion in fine pieces. Pour 1 tbsp. of EVOO in a saucepan; add the diced onion and sauté on medium-high heat. Put in the speck and cook until it gets crunchy, be careful it doesn’t burn! Next, add the rice, stirring to coat with oil. When the rice has turned a golden color, pour in some beer at a time, stirring constantly until the beer is fully absorbed. Once the beer is fully absorbed, add half a cup of the broth and stir until it is absorbed. Continue adding it, half a cup at a time, stirring continuously, until all liquid is absorbed. Rice will be ‘al dente’ (tender yet firm to the bite) in about 15-20 min. A few seconds before removing from heat, add in a tbsp. of mascarpone. Season it with salt & pepper to taste. Remove from heat and add fresh chopped parsley. Décor the plate, as you like and enjoy! If you don’t have 15 minutes to prepare the stock, go with a packaged organic vegetable broth. I tried Central Market Organic Vegetable Broth and it does the job nicely. Here are some of my own tips for your grocery shopping. Mascarpone. The most similar to the original is Bel Gioioso (in the light green package). Rice. I use Vigo Rice, the only good one I’ve found so far at a reasonable price. Don’t forget! The rice you pick must be for risotto: Arborio is what fit best for my taste. Carnaroli is also good, yet it firmer in texture (higher starch content). Vialone Nano is another good option. Acquerello is a great chef’s favorite and – of course – very expensive. Speck. 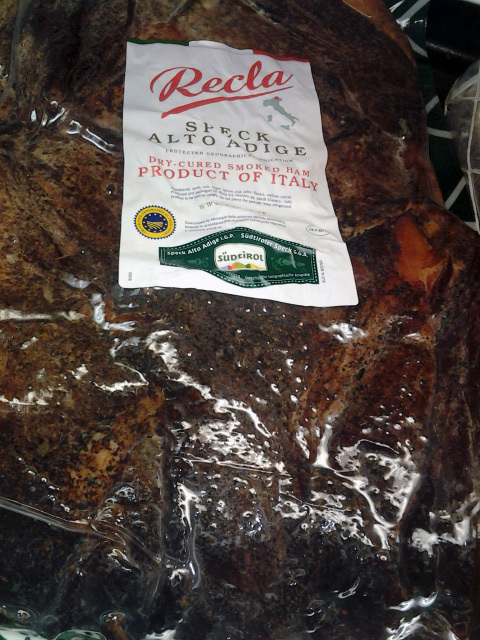 The original Speck from Alto Adige has a distinctive logo on the package. I buy it at Central Market in the Salumeria (Deli Dept.) Yum!